Peter Stewart is Director of the Classical Art Research Centre and Associate Professor in Classical Art and Archaeology in the Faculty of Classics at the University of Oxford. In the first posting on this blog, Jessica Hughes mentioned an intriguing case of ephemeral votives — the sort of offering that leaves no traces for archaeologists to find. In different ways, ephemeral offerings must have played an important part in ancient Greek and Roman votive practices, but for obvious reasons the evidence is tantalizingly thin. Perhaps we get just a glimpse of such perishable offerings as garlands and painted wooden panels (pinakes) in art, notably in the so-called sacro-idyllic landscape paintings which Romans often had decorating their frescoed walls around the first centuries BC and AD [fig. 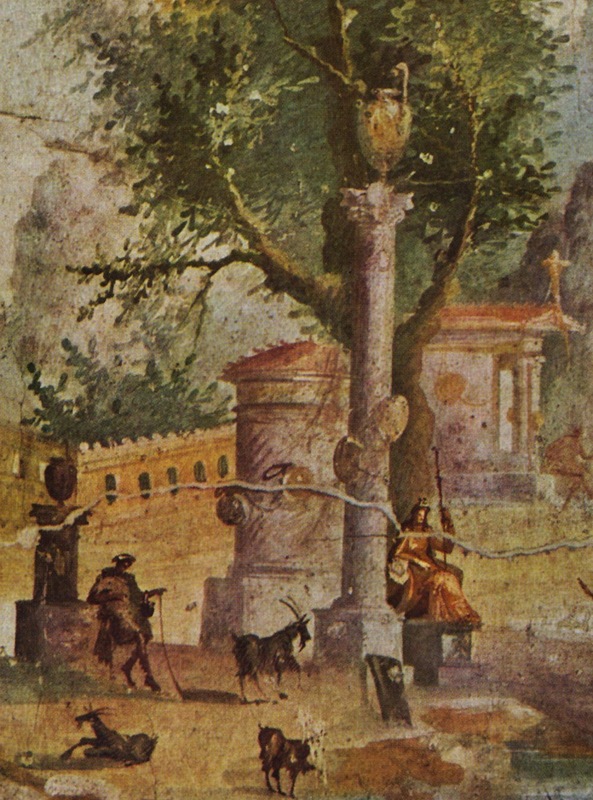 1] (the picture is a detail from Boscotrecase, including a votive panel leaning against a column). These are idealized fictions of refined rural life, but the religious details are not implausible. To understand how ephemeral votives might have worked in antiquity we can do no better than look at the modern religions which use similar practices, and in particular paying close attention to the ebb and flow of devotees’ offerings over time. 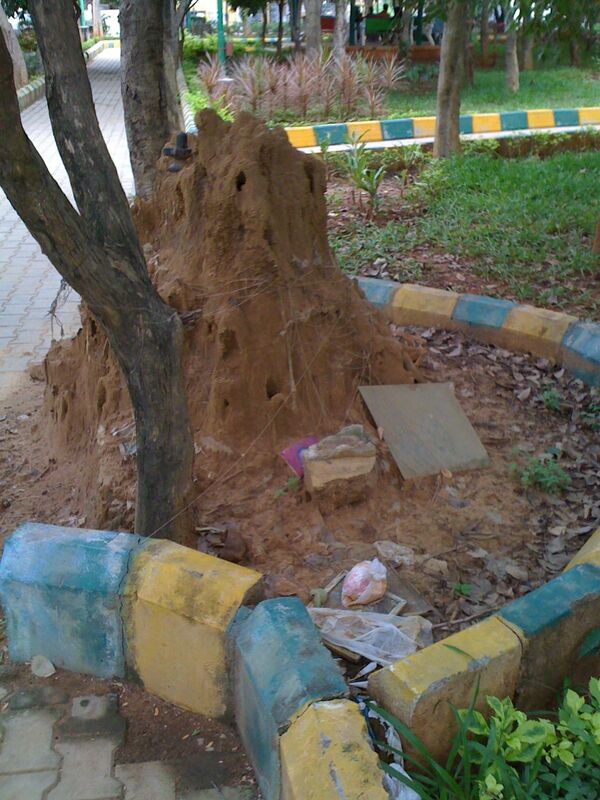 Let’s look at a contemporary example from India. 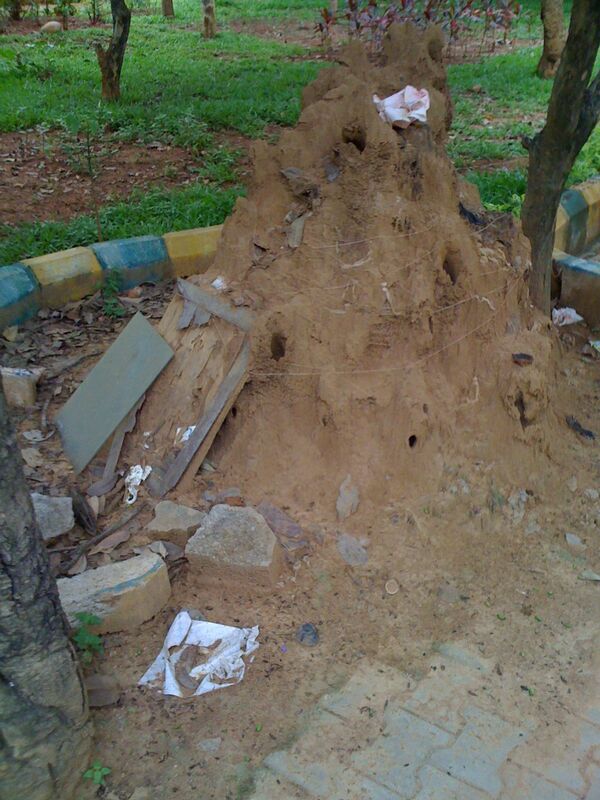 The photographs here show a termite mound in Bangalore — quite a common focus for worship in southern India — over a period of five months in 2011. It gives a fascinating insight into the everyday life of votives. On this mound more tangible classical-type pinakes and sculptures come and go alongside food offerings, libations, and floral offerings. On 10th April the mound is wrapped in gossamer-like strings which are the remnants of rotten festoons. Some woollen fillets remain intact on the left side. Blackened lamps stand at the base below them. (Less clear in the photo are the bright marks left by turmeric and other coloured spices.) To the right of the tree-trunk is a black stone statuette of Shiva(? ), smeared in liquid offerings. Four more discernible objects lie to the right of this: a framed black and white print showing a triad of garlanded deities (Lakshmana, Rama and Sita together with Hanuman); behind it a colour photograph of a man (whether a holy figure or a loved one for whom prayers or remembrances are made is unclear, given the condition); and further to the right a sheet of glass, evidently the detached front of another framed image; a further dedicatory picture leans against the breeze blocks, its frame just visible. On 15th July [Fig. 3], after four months’ tides of decay and new offerings, the scene is rather different. Less still remains of the festoons around the mound. The lamps and the statuette have gone, presumably removed deliberately. The framed print has also vanished (we can now see the fragment of breeze block it leant on), while the picture that was placed near it has disintegrated altogether, its remains lying on the earth. The photographic portrait and sheet of glass are still there, though dustier. There are new dedications also: a food offering in a plastic packet on the flattened picture and a portable stone Shiva linga placed near the top of the mound. The other side of the mound tells a similar story. On 27th May, for instance [fig. 4], a rather forlorn scene of decay: the remains of garlands and an intarsia devotional image; lamps to the right of the mound. In the foreground and on top of the mound are plastic milk packets attesting to earlier offerings. Suddenly, however, on the morning of 5th August, the entire mound is transformed [fig. 5]. The decaying picture can still be seen but the shrine is rejuvenated with fresh floral garlands, sprinkled flowers, coloured spices, lamps (some in plastic dishes), woollen fillets, banana leaves that had held food offerings, and crowning the mound a new pinax offering: a framed picture of a divine triad against a vivid blue background. The pinax shows signs of wear or damage on the image itself and had perhaps been used domestically or in a previous dedication. 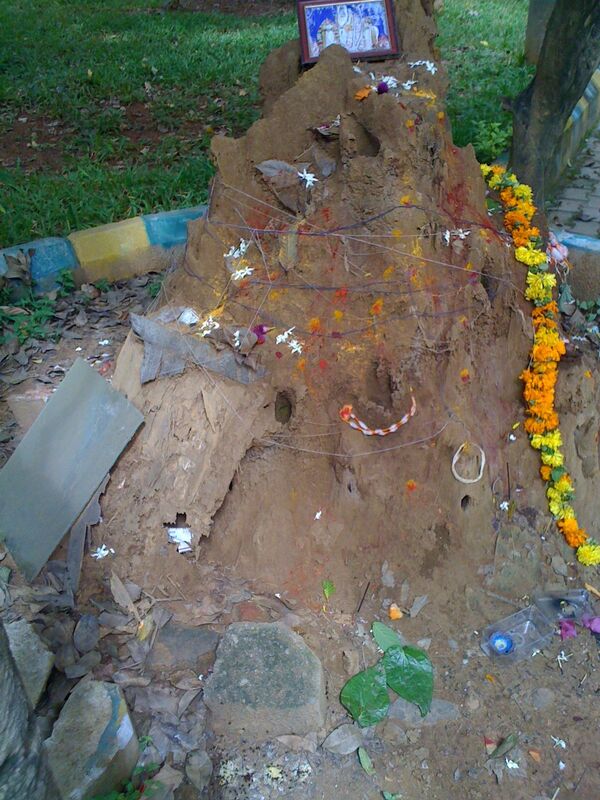 These offerings were evidently connected with the snake festival of Nag Panchami which occurred on 4th August in 2011, and they attest to the importance of a ritual calendar in punctuating the cycle of personal dedications through the year.